"Tyus proves as winning a storyteller as she was a runner...The 'a' in Wyomia is silent, but thankfully, the woman who owns that name is not." "Tigerbelle offers a fresh perspective on the history of women's sports in the United States. From her one-of-a-kind accomplishments on the track to her contributions to equal pay and publicity for women through the Women's Sports Foundation, Wyomia Tyus has earned her place in the pantheon of American sports sheroes and heroes." "Wyomia Tyus may not be as well known as Wilma Rudolph or Billie Jean King, but her athletic accomplishments and life story are equally captivating, as related in this remarkable and inspiring memoir...This deeply moving book by one of our greatest athletes makes indelible statements about integrity, growing up black in the South, social activism, gender equality, and inclusion." "One of the standout athletes of the 1960s]...Carl Lewis, Gail Devers, Shelly-Ann Fraser-Pryce and Usain Bolt later joined Tyus in the multiple Olympic 100m titles club, but Tyus, a standout of Ed Temple's Tennessee State Tigerbelles track teams, will always be the first." "Olympic sprinting champion Tyus' moving memoir not only recounts her athletic triumphs but it also makes indelible statements about growing up black in the South, social activism, gender equality, and inclusion." 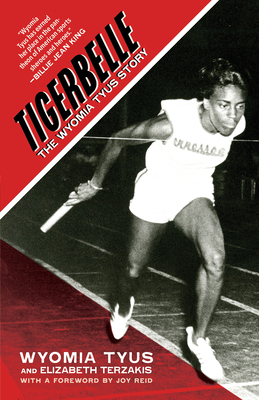 --Booklist, "Top 10 Sports Nonfiction: 2018"
"Wyomia Tyus' descriptions of the Tigerbelles' team unity, the friendships that developed even in the midst of hard times, and their eventual championships, both individually and as a team, provide a look at a time and era in sports and women's history that doesn't get nearly the exposure as it deserves...Tigerbelle: The Wyomia Tyus Story is a book all fans of any sport, but particularly those who love track and field, will enjoy. But it also covers an equally important slice of history, both for HBCUs and women's sports, that should never be forgotten nor undervalued." "Read it: For an important memoir of Wyomia Tyus, the first athlete to successfully defend an Olympic 100-meter title, winning in 1964 and 1968. From a tenant dairy farmer to a Tennessee State Tigerbelle to an Olympic champion, she reveals the struggles she faced to get to the top as well as the challenge to gain recognition as a black female athlete." "A half-century after her triumph, a record-setting Olympic champion recieves her due... Tyus] has lived a life of accomplishment and meaning. An inspirational story that deserves to be told." In 1968, Wyomia Tyus became the first person ever to win gold medals in the 100-meter sprint in two consecutive Olympic Games, a feat that would not be repeated for twenty years or exceeded for almost fifty. Tigerbelle chronicles Tyus's journey from her childhood as the daughter of a tenant dairy farmer through her Olympic triumphs to her post-competition struggles to make a way for herself and other female athletes. The Hidden Figures of sport, Tigerbelle helps to fill the gap currently occupying Black women's place in American history, providing insight not only on what it takes to be a champion but also on what it means to stake out an identity in an often hostile world. Tyus's exciting and uplifting story offers inspiration to readers from all walks of life. With a foreword by MSNBC host Joy Reid, and an afterword by sportswriter Dave Zirin. Elizabeth Terzakis teaches English and creative writing at a community college in Northern California. Her fiction has appeared in New England Review, Minerva Rising, Solstice, and Birdland Journal, and her nonfiction publications include articles on the global AIDS crisis, education, free speech, human nature, and capital punishment. Tigerbelle is her first book.